The Secret Keepers by Trenton Lee Stewart. Little, Brown Books for Young Readers, 2016. Hardcover. 512 pages. A little over a year ago I began reading Trenton Lee Stewart's The Mysterious Benedict Society and absolutely fell in love with Stewart's witty, approachable, and adventurous writing. I particular enjoyed that although his books were written with a younger audience in mind, they are completely accessible to all ages, and I can't imagine any age group not being able to find something entertaining in them. The reason I say all of this is because The Secret Keepers, his latest release, is every bit as wonderful as his previous books and I fell right back in love with his writing. I had read maybe ten pages when I realized that this was going to be yet another stand-out novel by the masterful Stewart, and I had such a fantastic time diving into this unique, intriguing world. The story begins when eleven-year-old Reuben comes across a watch that appears to be broken, However, he soon realizes that the watch is actually a bit more peculiar than that, and what it actually does ends up being something that more than a few people are after - both good and bad people, that is. The rest of the story consists of his journey to unravel the mystery of the watch and why it is such a treasured, sought-after item. This book is set in a somewhat dystopian-esque setting, but if you're wary of dystopian, please don't let that stop you. It's a rather minor aspect, but at the same time it also sets up for the crucial plot points of this book. I don't want to go into too much detail about what all of it means, but please trust me that it is well worth reading to find out. Let's talk about Reuben, who is extremely clever and about a thousand times smarter than I was at his age - hell, he's probably smarter than me now, too. Reuben is a tough, adventurous kid who is not afraid to take on some of his own responsibilities, and I think that is a wonderful quality for a character in a book (and one I believe he probably inherited from his mother, but more on her later). There are so many books where the main character seems to have difficulties owning up to their mistakes or realizing they have a responsibility to do something and it drives me nuts, so it was refreshing to see such a young character actually embody qualities such as these. Mrs. Genevieve and Penny are also wonderful additions to this book, and both characters brought their own unique charm. Penny is a bold, awesome little girl that was such a joy to read. She brought in an extra level of wit and entertainment that really enriched the story. Mrs. Genevieve was also quite a quirky characters; she appears rather aloof and not overly friendly when we first meet her, and although she remains somewhat distant, her endearing demeanor and care for the children truly make her a great character. The villainous Smoke was also another fun villain created by Stewart. I found many similarities between The Smoke and the villain of The Mysterious Benedict Society, but he was still a solid villain with a wide array of strength and weaknesses. I like that Stewart gives his villains his so many strengths, including intelligence, which helps to make the playing field a bit more exciting. I think one of my favorite aspects of this book, however, was Reuben's relationship with his mother. There was something about it that just seemed so realistic, so tender that I couldn't help but cherish every scene they had together. Reuben and his mother are not exactly well-off, and his mom works multiple jobs tirelessly so that Reuben can maintain a healthy, stable lifestyle. Reuben knows his mom works incredibly hard, but he also realizes that she never complains, which was the trait I found most admirable. Reuben is a great character - as are all of the rest of the characters - but I have to say that his mom is the real hero in this book. When I picked up this book from the library, I had no idea it was as long as it is - 500+ pages! This book is geared toward a younger audience, but if not reading aloud with children, I would probably give it to kids who are dedicated and prepared to sit down and read such a long book. It's certainly worth it, but I can see some kids becoming discouraged by the sheer volume of this book. This book absolutely deserves each of the five stars I am giving it! I would highly recommend this to anyone with a love for intrigue, adventure, and wit. 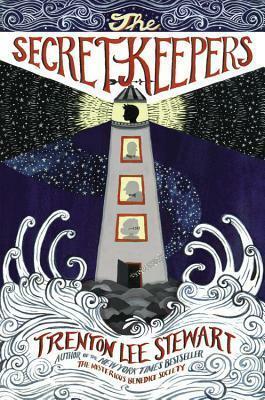 If you enjoyed Stewart's other books or Lemony Snickett books, I would definitely give The Secret Keepers a go. ooh, I have this on my kindle. Might have to move this to the top of the tbr pile - great review.